Bluewater Plumbing, Heating, and Air Conditioning installs, repairs, and maintains all types of systems for backflow prevention in Queens and the surrounding areas of New York. From common irrigation controllers to large scale commercial and industrial water purification process, our skilled plumbers can take care of your need for all types of backflow preventers. Automated monitoring systems as well as traditional backflow prevention devices can be installed to your specification or by our custom design. When it comes to backflow prevention in New York, you can ensure the cleanliness and quality of your water by partnering with the experienced professionals at Bluewater Plumbing, Heating, and Air Conditioning. 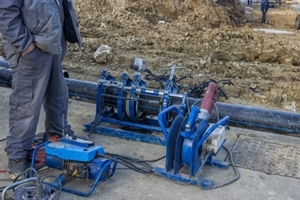 A backflow prevention device is used to protect potable water supplies from contamination or pollution due to backflow. In water supply systems, water is normally maintained at a significant pressure to enable water to flow from the tap, shower, or other fixture. For most installations, DEP specifies approved airgap RPZ backflow preventers on main incoming water services. Yet there are many cases in which check valves and vacuum breakers are practical and acceptable. A seasoned professional Queens plumber is vital in order to determine which is the correct application for each service. There are several types of backflow prevention systems available to you. For instance you can choose from domestic, sprinkler, or a combination of features such as adding fire protection. Incorrect backflow preventer installation or using the wrong device altogether can prove quite costly - and sometimes dangerous. The right system, however, will operate efficiently and do exactly what you need it to do. Because of the complexity of the thousands of existing structures in New York City, the DEP recognizes the need to review installation requirements on a building-by-building basis. We offer comprehensive inspections of your property in order to provide you with a custom designed system that is suited for your specific needs and your property. To learn more about backflow prevention or to schedule plumbing services in Queens or nearby with our experienced plumbers, please give us a call at 866-763-5302. We'll gladly answer your questions and set up your appointment. If you are interested in devices for backflow prevention in Queens or the surrounding areas, please call 866-763-5302 or complete our online request form.